Mulldrifting: ROE Drafting: An Exercise in Patience? ROE Drafting: An Exercise in Patience? I've drafted ROE three times thus far, and I'm learning a lot about this set. One advantage to doing team drafts is that you pay more attention to other people's drafts and games - and people give advice more openly. So a lot of opinions are thrown around, and you get to hear multiple sides of a story. I haven't had much success in draft yet personally, and this format is all very new and baffling to me. But I'm gaining confidence with each passing day. I do have to warn you that much of what I say in this article... might be wrong. But I speak from the perspective of someone still in the experimental stages of drafting. ADDENDUM: Remember I said Consuming Vapors would see $8? That was either an extreme exaggeration or I was thinking of Dealer Prices at Big Events. I think $8 is too much for a rare that is getting opened by the metric ton. During PTQ season, I think Consume the Meek and Consuming Vapors will go up to $6-7 at some point but in 3-4 months will drop to $2 each. I think these rares are comparable to Malakir Bloodwitch in this regard. Anyway, onward! I shall try to go over most of what I've gleaned. The thing most people notice about the set is that U/W doesn't make Eldrazi Spawn but has a lot of good levelers as well as Leveler-synergistic cards like Venerated Teacher and Time of Heroes. While the Jund colors all get ways to make Eldrazi Spawn. Red and green in particular are incredibly good at making lots of Spawn earlier. Immediately, you can see there is a divide - blue and white play nice together; red and green play nice together. And black seems to provide lots of good filler for both sides. However this isn't to say that different color pairs don't work together. In fact there are other synergies with other color combinations (for instance, G/W Auras), but I have no idea what the optimal color combinations are yet. I just get the feeling UW and GR are on clearly opposite sides - in terms of mechanics and certain deck strategies. These are the archetypes I think Wizards is making obvious pointing gestures toward. WotC is saying, "Look! These colors work together! Try it out!" Some decks can certainly revolve around certain commons. The key cards have to be commons because you have to ensure you're getting multiples. However if multiple people are eyeing the same commons, you could be left in a really difficult position. Since decks that revolve around a key card but don't have enough copies of said key card could be ten times worse. Obvious card is obvious. I expect this card to be fought over quite a bit because it is one of the key cards to the Leveler deck. Any deck with 6+ Levelers wants this card. And the more levelers you have, the more you want it. Multiples of it. Currently I have no idea. This card works best in UW or UB where there are common levelers. Red and green don't have any common levelers. Here is my first ROE draft deck, which went 2-0 and split in the finals. 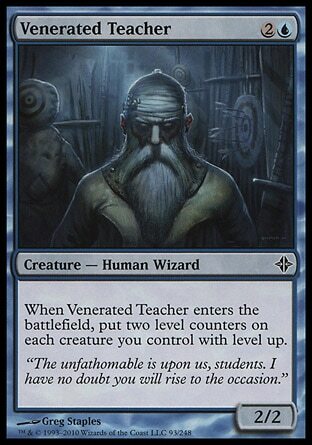 It only has one copy of Venerated Teacher, but I think I would've liked 2-3 copies. Really, really good. Should've been obvious, I thought, but it went around pretty late, and I somehow managed to snag two copies. LSV didn't give this a very favorable review, but I think it's just snazzy on fliers. You just have to play around instant-speed bounce and removal, which all cost 3-mana. Shouldn't be too hard to see coming at all. Oust is still a problem. As well as the "steal, sac" combo. Should've probably ran one more land... I was usually short on them. Could've cut Lay Bare for another Plains. 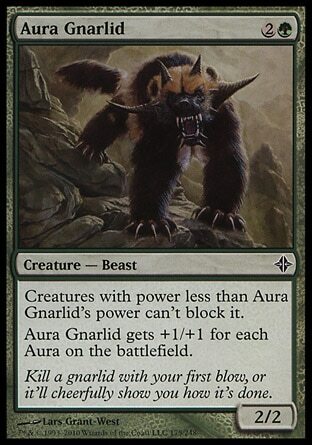 UW is an attractive archetype for many drafters. It's easy, it's obvious, the archetype is practically laid out for you. It has some unfair starts with Venerated Teacher, so can steal some wins from nowhere. For me, this is the "easy way out". And I think I should avoid this archetype if I want to actually experiment and try new things. UW is a dead-end for me. But I won't force the issue if UW is forced on me. This is another key card. Usually in GW with a bunch of Umbras. Kor Spiritdancer (an otherwise unwanted rare) is rather sick in this deck, and Snake Umbra is pretty good on the Gnarlid, since the Gnarlid has built-in evasion. The deck has a couple vulnerabilities, but because of how conditional all the removal is in this set, it's not nearly as bad as it seems. Just don't get Ousted. This deck can have very fast starts and will tend to blow all the slow decks out before they get their feet on the ground. The key is supplementing green with evasive white creatures and, of course, having lots of Gnarlids. White is the preferred pair color because it has the most Umbras at common; however I think it could work with blue, too. If I ever manage to draft this archetype I will put up a sample decklist. You know times are strange when red is the color of defenders. I point and laugh at my opponent's Glory Seekers when I have a 3/3 on defense. But maybe the joke's on me because my creatures can't attack... or can they? Wish this card was common. But I guess it would be bad to nullify all the Guard Duties with an equipment. I am not sure what the "defender" archetype looks like or does exactly. 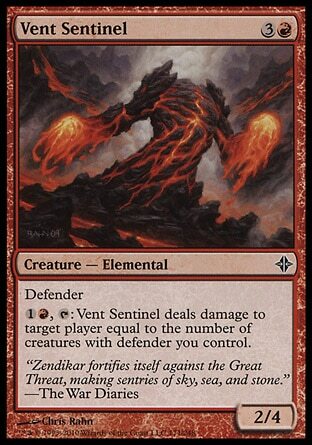 But I think Vent Sentinel is a key card in the deck. It has the built-in win condition for you! You don't necessarily need to stall and ramp into an Eldrazi to win here. But you can have Plan A and Plan B, just in case your opponent has an answer to one or the other. Red has plenty-good removal, too, so you can supplement the wall plan with an artillery. 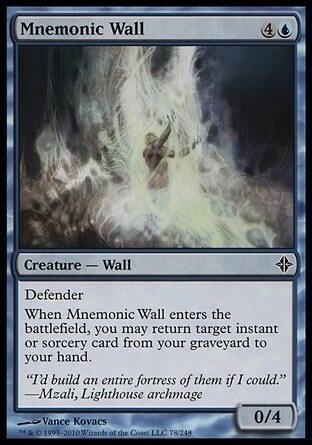 And I like Mnemonic Wall to get back Staggershocks or Flame Slash. However I don't think the "defender" archetype is necessarily UR. It might even be three colors. This archetype seems pretty flexible. Lots of room for experimentation here. When I first heard of the whole "Eldrazi" concept, I thought Limited would be all about Eldrazi. I thought both sides would have tons of permanents, a big Annihilating creature, and a lot of sacrificial lambs in the back and forth swings. I was wrong. It's a lot more like regular Magic. But still pretty weird. The format is still hella slow, and board stalls happen regularly, but there is NOT an Eldrazi for every boy and girl. So don't be fooled into thinking that it's an Eldrazi free-for-all. Already made obvious by the fact blue and white don't have any ramp. In my last deck, an aggressive BR deck, my curve topped out at 6. I ran 17 lands. I don't think I ever got to 9 mana. Most of my games ended before turn 10. And in one of them, there was a point in the game where there was only one non-land permanent left standing (an Ogre's Cleaver). There was a fast-paced race, where I was getting beat down hard but managed to stabilize somehow. I killed off my opponent's last creature with a topdecked Bala Ged Scorpion, equipped it and swung for 7. But then my opponent topdecked a Traitorous Instinct, and I died promptly to my treacherous 9-powered Scorpion. Talk about a swingy game. But definitely not a slow build-up to some big monster. A good number of the decks race, while others stall. The trick is to know who's the beatdown at all times. When do you race, and when do you trade? I thought my BR deck would be fairly aggressive, but I was clearly on defense against my opponent in that game I described, who was GR. His Battle Ramparts helped his creatures enter the field running. The question is: Which deck archetypes will have the most success? The slower ones or the faster ones? How reliable are greedy strategies? How reliable are key-card strategies?